Andrea Sinz received her degree in Pharmacy from the University of Tübingen (Germany) in 1993. She obtained her Ph.D. in Pharmaceutical Chemistry from the University of Marburg (Germany) in 1997. From 1998 to 2000 she was a post-doctoral fellow at the National Institutes of Health in Bethesda, MD (USA) where she got introduced into chemical cross-linking and protein mass spectrometry. From 2001-2006, she was head of the junior research group ‘Protein-Ligand Interaction by Ion Cyclotron Resonance Mass Spectrometry’ at the University of Leipzig (Germany). Since 2007, she is Full Professor and head of the Department of Pharmaceutical Chemistry and Bioanalytics at the Martin Luther University Halle-Wittenberg (Germany). 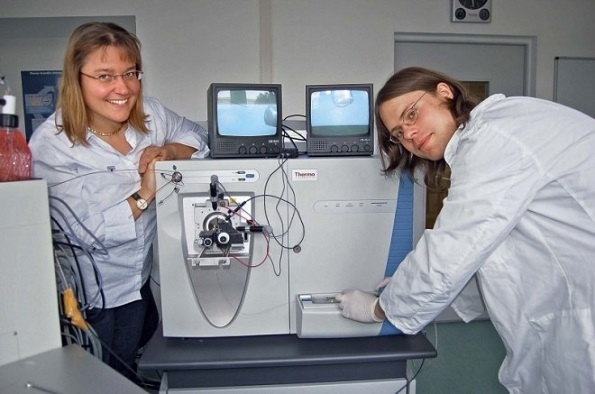 Since 2017, she is president of the German Society for Mass Spectrometry (DGMS). Andrea Sinz is an expert in chemical cross-linking and mass spectrometry for studying protein 3D-structures and protein interactions. Her research interests are the development of novel analytical strategies and reagents to advance the cross-linking/MS approach. During the last 15 years, chemical cross-linking combined with mass spectrometry (MS) and computational modeling has advanced from investigating 3D-structures of isolated proteins to deciphering protein interaction networks. Chemical cross-linking relies on the introduction of a covalent bond between functional groups of amino acids within one protein, to gain insight into the conformation of a protein, or between interaction partners to elucidate interfaces in protein complexes. Based on the distance restraints derived from the chemical cross-linking data, three-dimensional structural models of proteins and protein complexes can be constructed. Most commonly, homobifunctional amine-reactive cross-linkers, such as N-hydroxysuccinimide esters, are used for studying protein conformations and for mapping protein-protein interactions. One of our goals is to extend the arsenal of existing cross-linkers to obtain complementary structural information of proteins. To facilitate the identification of cross-linked products, we have designed MS-cleavable cross-linkers creating characteristic marker ions in the fragment ion mass spectra. A direct way to probe protein-protein interactions relies on the incorporation of photo-reactive amino acids. These photo-reactive amino acids contain diazirine groups and are activated upon UV-A irradiation. As such, they possess the potential to study protein interactions in-vivo. In my talk, I will give an overview of different cross-linking strategies and illustrate them for studying the tetrameric tumor suppressor p53 and the calmodulin/Munc13 complex.